Last night I decided to up the numbers on my pedometer and walk home from my son's soccer practice while the kids drove home with their daddio. Trekking through the woods at the corner of the park and along the streets'-edge to get from Point A to Point B, it was approx 5,000 pedometer steps--roughly 2.5 miles. A nice hike. I didn't make it out of the park and most certainly not through the woods before I was returned to the "plastic on my brain" phenomenon of the week. I was wishing for one of those "clever and illustrious creatures" from "The Majestic Plastic Bag: A Mockumentary." 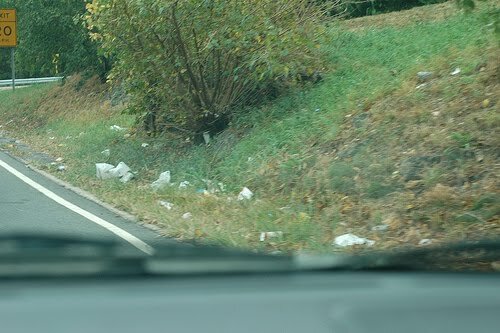 A plastic bag would have been good for picking up roadside trash. However, I wouldn't have made it far before filling the bag. Plastic lids, Gatorade bottles, Styrofoam cups, juice boxes, aluminum cans, glass bottles, crushed crud, and more. One bag wouldn't have cut it...I'd have needed 8, 10...perhaps even a dozen wouldn't have been enough. I found myself thinking of the book I'm currently reading: Thomas M. Kostigen's "You Are Here: Exposing the Vital Link Between What We Do & What That Does To Our Planet." It especially got me thinking about Chapter 8: "Where The Currents Take Our Trash: The Eastern Garbage Patch, Pacific Ocean." There's more to the problem than just the pollution and the harm to wildlife. In reading this chapter, I discovered a more insidious problem to the Oceanic Garbage Patches. Two in fact. Given there's 6 times plastic in the ocean than zooplankton, the zooplankton (who will eat anything they can ingest) are eating the tiny beads of degraded plastic called nurdles (which never fully go away or disappear). The example in the book is that the Blue Whale, who eats 4,000--16,000 pounds of zooplankton per day, will undoubtedly be consuming one heck of a lot of plastic. This will hold true anywhere on the food chain. And ultimately it finds itself on our dinner plates in the fish that we eat. Our pollution is harming our own endocrine, nervous, immune, & digestive systems. But wait! 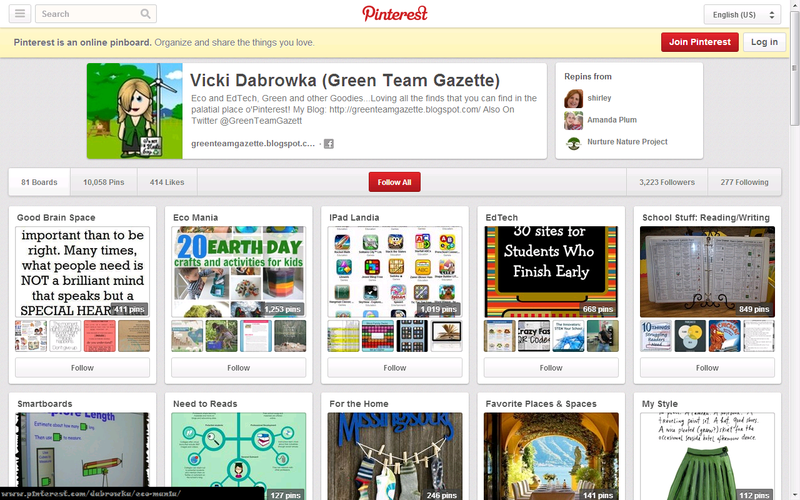 There's more than the ill-effects to our health, marine wildlife, and pollution! The plastic debris is not merely on the surface, but also lower, which then blocks sunlight to lower levels. Not good for the phytoplankton and plants at the bottom of the ocean. With that blockage, the oceanic plant life can't do the important job of photosynthesis (when green plants/algae take in carbon dioxide & release it as oxygen--which we & other mammals breathe in). Therefore this too causes an increase in the amount of carbon dioxide on the planet. This, in turn, perpetuates the vicious cycle of adding to the already-too-much greenhouse gases that are out there. 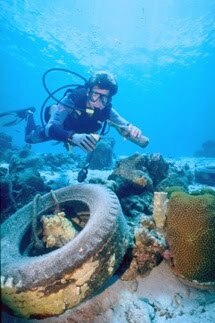 Secondarily, the plastic (estimated between 200,000 -- 2,000,000 pieces per square mile, according to Kostigen's "You Are Here,"), settles to the bottom creating a plastic coating layer on the ocean floor, which further locks the nutrients we need for a healthy planet. "So in effect, the extend of plastic's damage on the marine ecosystem could be far graver than merely pollution itself; it may upset Earth's natural balance and disrupt the huge role of the oceans in regulating the global carbon cycle. Plastic could, very simply, be preventing the oceans from hiding vast amounts of carbon, making the Earth heat more rapidly than it naturally would." That's some pretty heavy & burdensome thought on a 2-mile trek home from soccer. Especially when I know that trash that gets blown into the water has an approximate 4-5 year journey to get to one of the Garbage Patches that's out there, swirling in each of our oceans. 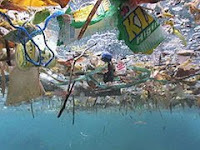 If the Great Pacific Garbage Patch is this big now, what will it be like 4-5 years down the road?! It's a daunting thought--all that trash out there in the world. A swift wind could pick any of it up and deposit it into a waterway leading to the ocean. It's a massive and mind-boggling job: the thought of even attempting to pick it all up now. It totally emphasizes the need for each and every one of us to pick up anything we can, whenever we can, to get things off the ground. But, as overwhelming as it all is, it emphasizes the fact that although one person can't do it all, 6.78 billion people, all doing little somethings, amounts to a great big "lot of somethings." So maybe we all should adopt the philosophy of "leave a place better than you found it," and we might just inch our way to cleaning up the joint, little by little. To learn more about Thomas M. Kostigen & his book "You Are Here," you can go to http://www.readyouarehere.com/ or click the title above.